Having a productive day is something that most of us dream of. It’s important to get everything done in a good timeframe, and sometimes that means staying after normal working hours. 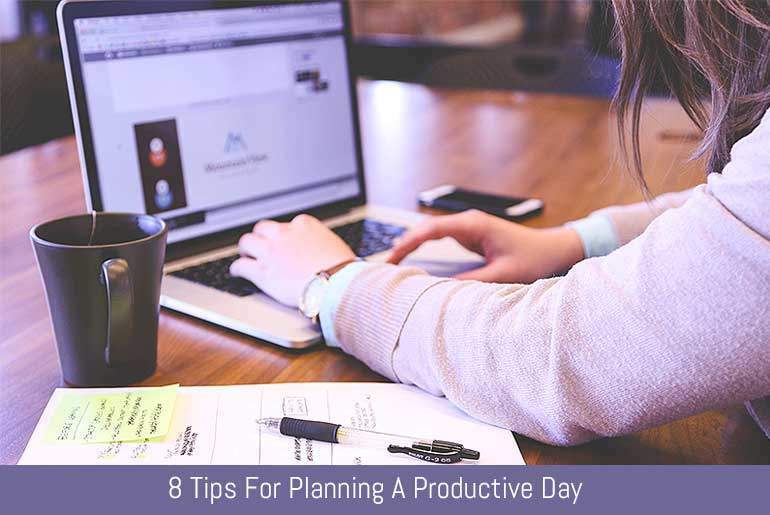 Instead of letting that happen, you can optimise your day to be the most productive with these 8 tips. Your best start is to plan everything before the day even starts. The night before, or right before you leave your desk for the day, write out a list of all the tasks you need to get done tomorrow. Try to assign times for each item to be started so that you can see whether you are on schedule to get it all finished. This will help you to see whether you have reasonable goals, too, so it’s worth doing your planning session well. Get up and crack on! Be better at mornings by getting enough sleep, having a morning routine that relaxes you rather than stresses you out, and get to work on time. This will set you up for a good day ahead. There is much research to suggest that starting with the hardest task on your list will give you a psychological boost for the rest of the day. You will feel lighter knowing that the worst is out of the way, and you will use that morning energy boost on getting the worst thing finished. After that, it’s plain sailing ahead. Make sure you are on track with a system that works for you. One option is to set a time to go off each hour. When it goes off, you’d better be able to cross off that hour of work. If you haven’t, it’s time to knuckle down and get it done. When you finish a task ahead of time – something that your schedule should allow – give yourself a break. Look at your Instagram feed, play a game on your phone, walk around the office to stretch your legs, look out of the window for a while – whatever works for you. Time your break so you don’t get too relaxed and end up falling behind on work. Make sure that you get plenty of brain food for your lunch! Skipping lunch can actually lower your productivity, so be certain to eat well and take at least 30 minutes for a break. Bananas, eggs, cottage cheese, yoghurt, nuts – these are all foods that will help give your brain a boost for the rest of the day. Especially if you don’t eat well, the 3pm slump is a real phenomenon that can derail your whole day. Instead of giving in, sit back and eat a piece of fruit. It’s a healthy snack which prevents you from turning to sugary alternatives, and will give you that much-needed energy boost. You could also go for energy bars or balls made at home. When home time is looming, make sure that you stay focused rather than daydreaming about what you’re making for dinner. Get those last items ticked off the list, and if you can’t complete everything, just do as much as you can. Reserve those ten minutes at least at the end of the day for planning out tomorrow, even if that means planning to start with what you missed today. A productive day is all about the right set-up, and being prepared. With a schedule, a good night’s sleep, and healthy food in your bag, you’re ready for your plan to succeed. Corinne Ledling is a business woman who’s very passionate about her job. She’s a Content Manager at Bizstats.co.uk and loves to share tips and tricks about productivity and efficiency.